Senate Majority Leader Harry Reid is targeting his Republican opponent Sharron Angle's more extreme positions in his latest campaign ad -- a theme that may be resonating with Nevada voters, but so far not enough to give Reid the lead in the race. The Reid campaign this week unveiled a new ad focusing on Angle's interest in phasing out Social Security and Medicare. The ad features Edward Coyle of the Alliance for Retired Americans saying that Angle's likening of Social Security to welfare is "insulting" and says her interest in eliminating the entitlement programs is "crazy." A NBC/ Wall Street Journal poll released this week shows that, at least on a national level, voters are uncomfortable with Angle's positions. Just 9 percent of voters say they would be enthusiastic about a candidate who advocated for privatizing Social Security, while an additional 15 percent said they were comfortable with the idea. As many as 48 percent said they were "very uncomfortable" with the idea, while another 18 percent said that position gave them "some reservations." Voters also said they uncomfortable with the idea of abolishing the Department of Education, another idea Angle supports. Angle has been hounded by the opposition, as well as the media, about her more extreme views and her hesitancy to talk about them to the press. Perhaps taking a cue from a fellow Tea Party favorite, Sarah Palin, Angle appears to be giving her side of the story via Facebook. She clarified her position on Social Security in a Facebook note yesterday, in which she uses a term made famous by Al Gore 10 years ago - "lockbox." "My plan has always been to save Social Security for those who have paid in good faith into a lockbox that has an IOU in it," she wrote. "Going forward we need to consider Social Security and Medicare on a personalized basis and the reason that we are moving toward personalization is to keep the government from raiding our retirement, raiding our healthcare." Today, Angle addresses another story that has hounded her in a Facebook note called "My Position on Scientology and Massages for Inmates." She clarifies that while she did as a state legislator review a program aimed at cutting prison recidivism that involved massages and other detoxification methods developed by L. Ron Hubbard, it was not a Scientology trip, and the review did not lead to any legislation or changes in government programs. Reid highlighted Angle's interest in the program in an earlier ad. But Angle still leads Reid in the latest poll. 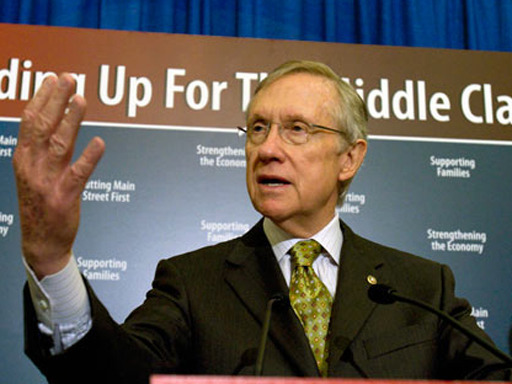 A Rasmussen poll released yesterday shows Angle leading Reid by 48 percent to 41 percent. Furthermore, a majority of Nevadans favor repealing health care reform, one of the most significant pieces of legislation Reid helped push through. Yet while Reid is very unpopular in the state -- 49 percent give him an unfavorable rating -- nearly as many (47 percent) find Angle unfavorable. Reid's unpopularity in the state could explain why his son, Rory Reid, isn't mentioning his last name in his own campaign for governor. Rory Reid launched his first advertisement this week that features small children and emphasizes his education platform. The ad instructs viewers to "download Rory's education plan" at the website Rory2010.com. Reid never says his last name in the ad. Rory Reid's last name is also missing from the home page of his website, and the biography page. "As Chairman of the Clark County Commission Rory has managed a budget bigger than the state's general fund for seven years, balanced it every year, and never raised taxes," the bio reads. "Rory, 47, grew up in Nevada attending public schools, as do his three great kids."